Back to school sales have already begun in our area, and I love buying school supplies for myself. Really. This is a great time of year to buy any office type supplies you might use in your genealogy research. 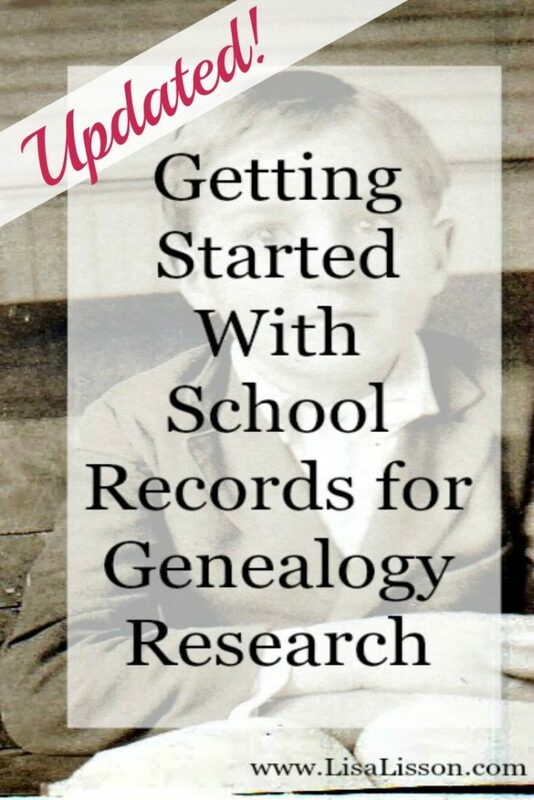 Back to school sales also lead me to think about school records that could be sources of genealogical information. Interestingly, I have had several questions asked about this topic recently. So, let’s talk about school records. What type of school records are out there? 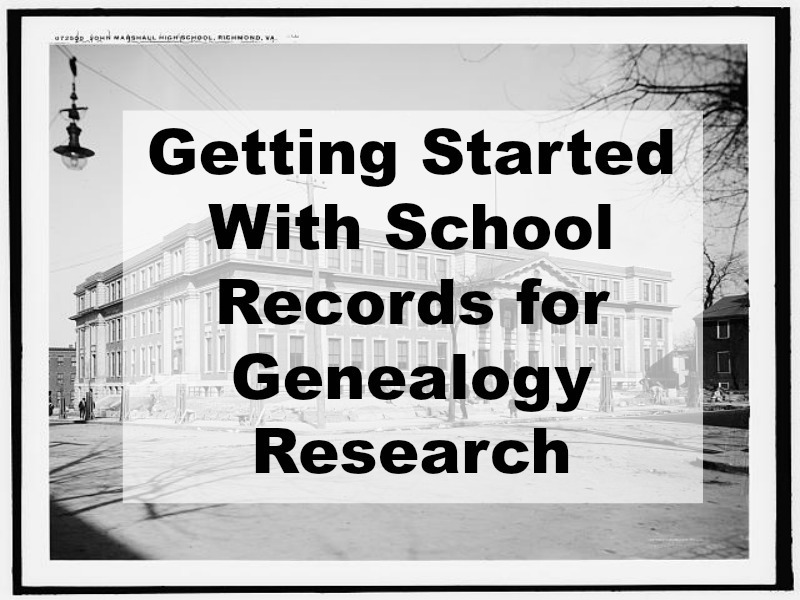 There are quite a few types of school records that will benefit your genealogical research. School Census Records / Attendance Records – This 1858 school register of Stanley County, North Carolina contains attendance lists. Some schools may refer to this as a school census. Either way, these records have a lot information for the genealogist researcher. Name, age, parents’ names (and sometimes occupation), and days attended are listed. When the parents are listed, you can infer siblings in the school and thus, family groups. In this Stanley County example, information about the weather and special events is recorded, too. Yearbooks – Yearbooks will provide information and of course, photographs of the students, the faculty and the teachers. You may well find collateral cousins in the yearbook as well. Often the families lived close together and would have attended the same schools. Read any notes other classmates wrote in the yearbook. These individuals are their friends and associates. Make note of these names for future reference. Lastly, look at the ads in the back of the yearbook. These ads will give you information about the type of community your ancestor lived in. Look at examples in this large yearbook collection at Digital NC. Student Newspapers – Student newspapers tell more about the student life of the school. Elon College’s online student newspapers date back to 1910. Annual Reports – The annual reports are created by the county superintendents and presented to the board of education. The 1901 Wilkes County School Annual Report is a great example. Included in the report is a list of Honor Roll Teachers, List of Students for Perfect Attendance, Graduation Lists, Perfect Spellers, and Library Certificates. Information and statistics on the county such as the number of homes with running water and number of homes with a telephone are found, too. This information provides the researcher with important information about the community. Report Cards -Though not as often thought about, report cards contain important genealogical information, too. From a report card, the child’s age and birth year can be approximated. 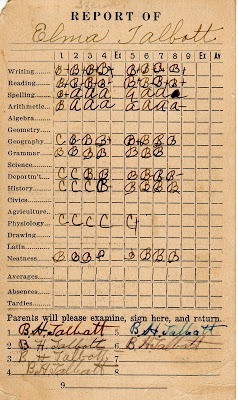 Often the custom was (and still is) for the parent to sign a child’s report card. This provides the researcher with a parent name and a signature. This signature could be important in later research for comparisons. 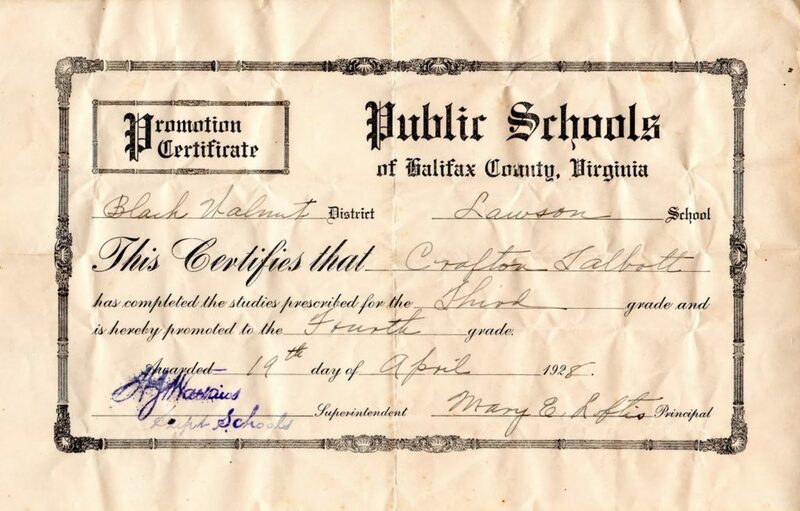 This 1930-1931 report card for Elma Talbott of South Boston, VA provides her father’s name and original signature. Where do you find school records? Now that you know what types of records are out there, where do you find them? School records can be found in a variety of locations. County and states will vary by what they have available, but start with these ideas. Be creative in your search process. 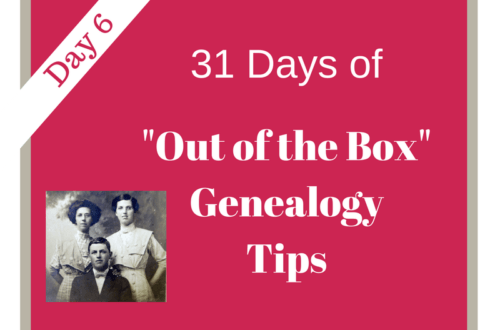 Family papers and records – Ask your family members including your more distant cousins, too! This is often an overlooked step in the research process. You may be surprised at what they kept and passed down. The report card above and the this grade promotion certificate were among our family’s keepsakes. Older members in the community – Ask former alumni or long term community residents if they have yearbooks or other school memorabilia. Your ancestors could be in them. 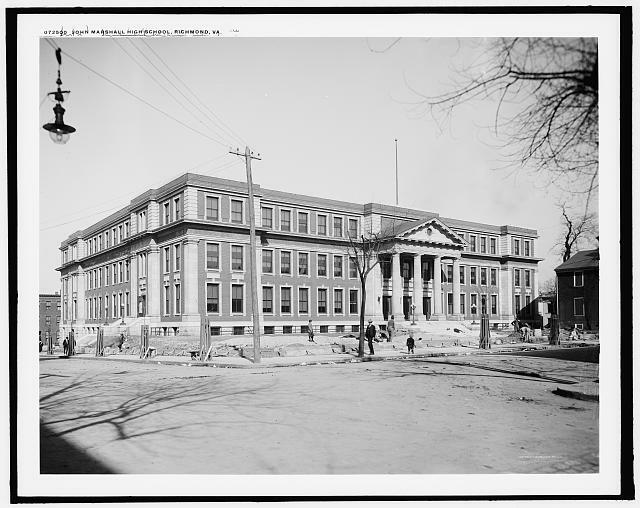 The School Itself – If the school your ancestors attended is still in operation, check with them for yearbooks and other public records. If the school is no longer in operation, check with the local school board where the records might be. Local historical societies – Often local historical societies and museums will have information on local schools past and present including old yearbooks. Along the same lines, check for pertinent historical sites in your area. An example would be the Charlotte Hawkins Brown Museum emphasizing African-American education in North Carolina. State Archives – State archives often have school records. Check their online collections as well. You could have a successful search sitting in your own home. University Special Collections – Check the university special collections in the area where your ancestors lived. Be sure and talk to the librarian! They can point you in the right direction and give you other ideas for your search. Online Genealogy Databases – Ancestry.com has school records! The best way to find them is by using Ancestry’s card catalog. 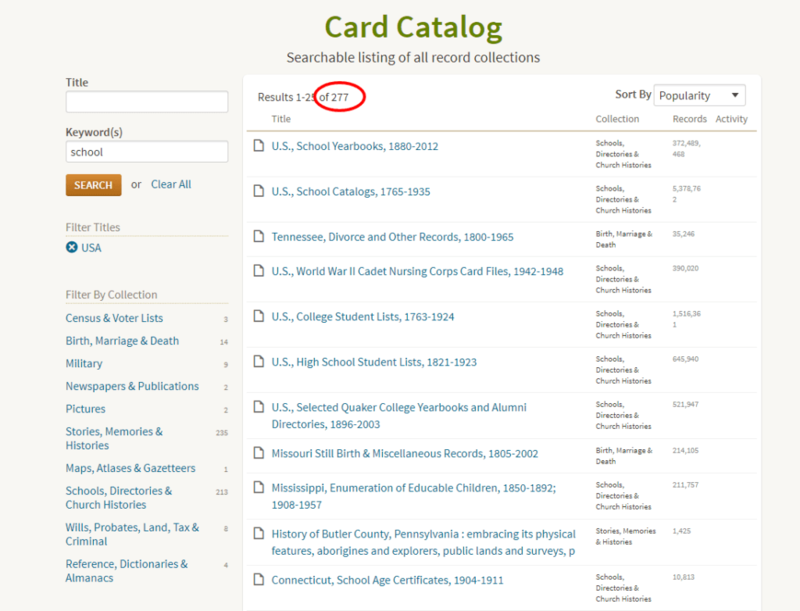 With a quick search of Ancestry’s card catalog for school records, 277 results came up for the US. Yearbooks, student lists, directories and school age certificates all appear in the first few results! These are definitely “out of the genealogy box” records! Modern school records might not be so easy to find. I graduated from high school in 1970 and when I asked about obtaining a copy of my school file, I was told they were destroyed after X (maybe 10?) number of years. I actually got photocopies of my elementary school records because we moved from one town to another when I was in the sixth grade. Because I didn’t finish the school year there, my records were stored in the basement in file cabinets and not sent on anywhere else. They apparently only photocopied my file to send on to my new school. I feel very lucky to have copies of my kindergarten reading skills tests and notes by my teachers that I had to be prodded to talk! You make a good point, Linda. A modern student’s personal record will not likely be saved or if it is not public. Thanks for pointing that out. I am so excited to be among your blog links for the week! Thanks so much for this, Loraine! Privacy for individuals is of utmost importance. I should clarify (and I apologize for any confusion), in talking about “school records”, I’m not including transcripts and health records. I’ve never seen these (outside of when I worked for a school system), nor would I expect to. The report cards and awards can sometimes be found among a family’s keepsakes. Thanks, again! Another initial source that lead me to the highschool in Pennsylvania was a class ring. On the side of it was the impression of the actual building and the other was the year. We only knew generally where the family was from at this point and were cleaning up the ring to give to his grandson when we noticed the clues. The building no longer stands but checking with different local museums as you suggest not only helped us find the school but they had the yearbooks and were happy to make copies of our ancestor’s pages including his nick name and what he aspired to be. Gold! What a great story! I had not even thought about using a class ring, but you really thought outside of the genealogy box. Well done!